There is not a single person in the world who doesn’t know about Cancun, the natural beauties that surround it, its Mayan history and the archaeological remains found in this region of southeastern Mexico. Enjoy a unique holiday in Cancun and get the best out of this tourist destination. Here are some tips for you to make your next vacation in the Mexican Caribbean something unique and memorable. Chichen Itzá, for example, was nothing more and nothing less than the capital of the Mayan Empire and it is now the region’s most important archaeological temple. At this site, you will come across sacred cenotes or the grounds where the Mayans used to play pre-Hispanic ball game. Get into the history and learn more about a culture that marked a turning point in human history. One of the reasons why so many people decide to go on vacation to Cancun, is, without a doubt, because of the incredible Caribbean Ocean, where it is possible to do different aquatic activities that will give you a different perspective on the marine ecosystem. There are many options for diving and exploring the reefs, sunken ships, cenotes and many corals. Prepare your diving accessories now! 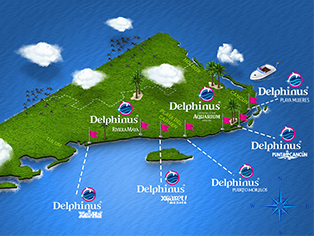 One of the best places in Mexico to experience this is in Cancun, where you can live a unique and special swimming with dolphins experience. The possibility of experimenting different kinds of interactions is almost unlimited. Swimming alone, with your partner, your family or children, swimming with dolphins in Cancun is recognized throughout the world because of its service, natural habitats, care for the species and the professionalism of the Animal Care Specialists, biologists and veterinarians. Xel-há and Xcaret are among the best aquatic parks in the world. There are activities for all ages and preferences, it is a must-do during your next vacation in Cancun. Zip line, explore subterranean rivers, watch shows full of magic, lights, colors and sound that represent the Mayan culture, walk through the jungle, cohabit with marine mammals, swim in cenotes, swim with dolphins in Cancun: the variety of activities in these parks in unique. We want to believe that, while reading this article you have been packing your luggage. Don’t let any more time pass by and enjoy everything this destination has to offer. We are waiting!